The action of the Run button is modified by a series of options. These options include the ability to prompt the user for input (Run with Prompt), the ability to inspect the data (Run with Full Inspection) and the ability to run in debug mode (Run with Breakpoints). 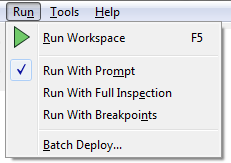 Users will notice this setup is different from previous versions of FME, where each of these options had a separate run button. For now, we can ignore these options and just use the Run Workspace option without modifiers. After running a workspace, related information and statistics are found in the translation log, which is displayed in the Workbench log window. The translation log reveals whether the translation succeeded or failed, how many features were read from the source and written to the destination, and how long it took to perform the translation. 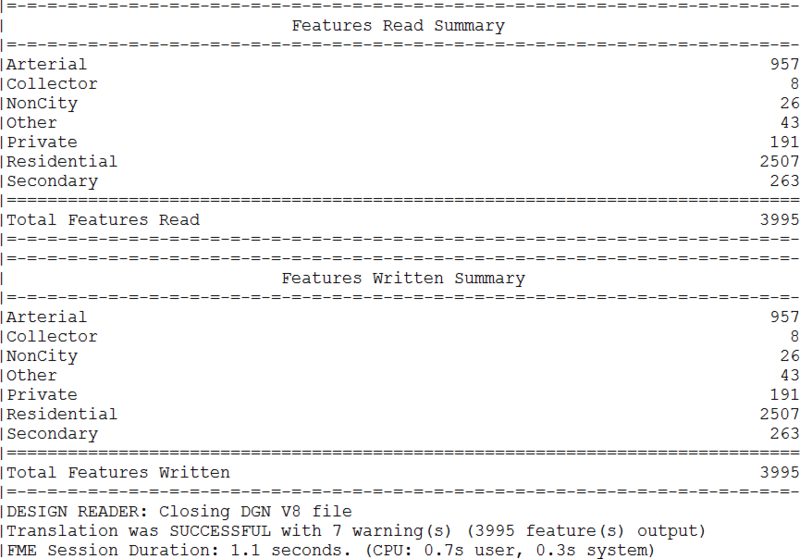 In this example the log file reveals that 3995 features were read from a MicroStation DGN file. These features were written to a MapInfo TAB dataset.. The overall process was a success (with some warnings). The elapsed time for the translation was 1.1 seconds.